This was the final frontier. The scariest single thing in knitting. cutting it. Let me back up though. See i knit my father a sweater for his birthday this summer. a fancy cabled vest. It was a thing of beauty in a chocolaty brown. However it magically became about 4 inches too big by the time i was done with it. (remember how i said i needed to pull my stitches tight? Well, i really really did. Ah well. So it was too big, andi do want him to wear it. So i needed to fix it. At first i thought i would just redo the seams but… 4 inches. Then i had 1 day to do it and the problem became much more streamlined. I took it to the sewing room. And i used a serger on it. a SeRGER. it stitched and cut my fabric. Cut it. My knitting. I may have had a bit of a panic attack there. But it was actually fine. The serger in fact anchored all the stitches neatly and the whole thing is now 4 inches narrower. Maybe i AM brave enough for steeking some day…. Mine is going. I just set the back and both fronts to block. Now to start the sleeves. This is of course the fun part since it is where the stripes happen. I at least am excited. 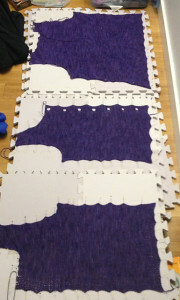 This blocking took way more pins then ever before, i really want to get this perfect. Spirit Trail Fiberworks Brigantia [85% Polwarth; 15% silk]: 600 yds/549 m per 210 g hank – this is the yarn i am using for my Tucci sweater, mentioned in a previous post. I am using Versailles for my sweater personally. This was the yarn that was recommended for the pattern but at first the price scared me away. However then i went to Rhinebeck (a post for later) and felt the demo knit up model. And suddenly just like that i was in love. Seriously i am not kidding. The Polwarth makes it all soft and luxurious a bit like alpaca. But the silk makes it all shiny and awesome. The feel of the fabric made from it is just so… OK the only word i can think of is delicious. The fabric is delicious. Now, this is not Malabrigo, which i maintain knits itself, but it is pretty darn close. I am not yet done with the sweater, but this yarn is a keeper. The skeins are HUGE. i am going to have leftovers. I am already making plans on what to do with that. What would you do with delicious purple yarn? No, not the scary guy you don’t stop to pick up on the side of the road. And not even the stray inch-worm that takes a ride on your shoulder in the summer. No, i am talking about Spinning wheels here. Specifically The Hitchhiker from the Merlin Tree. I picked up a double treadle version of this wheel used from someone on Ravelry. It is tiny and adorable. The foot-shaped pedals start conversations. The 10 pound weight and the ability for it to fit in an overhead bin on a plane were selling points for me though i have not in fact taken it on a plane . I have used it in my living room and taken it to Pennsic this past year. It travels nicely, packs compactly, and withstands the vagaries of being packed in a car for 12 hours with all the OTHER things i take for medieval camping for 2 weeks. At minutely under $300 new (plus $80 more for the second pedal) it is one of the cheapest, if not THE cheapest spinning wheels i have ever seen. Dave, the man who makes them, says all the parts can be bought at Home Depot. Mine hasn’t broken in the few years I’ve had it, so i cant attest to that. I can attest to Dave being awesome. When it didnt feel quite right at first, i brought it to him at a fair. He looked at it, took it apart, oiled all the things, switched a few parts out for newer ones, since he had done things differently in models later then mine, and handed it back to me, in glorious working condition. For free, in under 10 minutes. Dave, as we say on the Merlin Tree Ravelry group, is a saint. Now, i am no expert spinner. In fact, i am not that good at all. And this was my first real wheel (i am not counting the Babe, made of plastic and pvc pipe). so i can attest to it being pretty good for beginners. To start to write, one must write. To start to knit one must swatch. I have been knitting for years. 32 years in fact. Since i was 3. Yes, now you know my age. I used to knit flat things, but then something like 15 years ago i knit a sweater. And it sort of fit. Then i knit another, and it also sort of fit. Then i learned that hey, i should maybe swatch. And i hated it. With a fiery passion of a thousand burning suns. But i did it. And it kinda helped. My sweaters fit a bit better. Then i learned that i should wash my swatch. This in fact changed all the things. My sweaters fit better. However, two weeks ago i learned something completely new. I learned that my knitting is too loose to make sweaters. And that i could have known that from a gauge swatch. 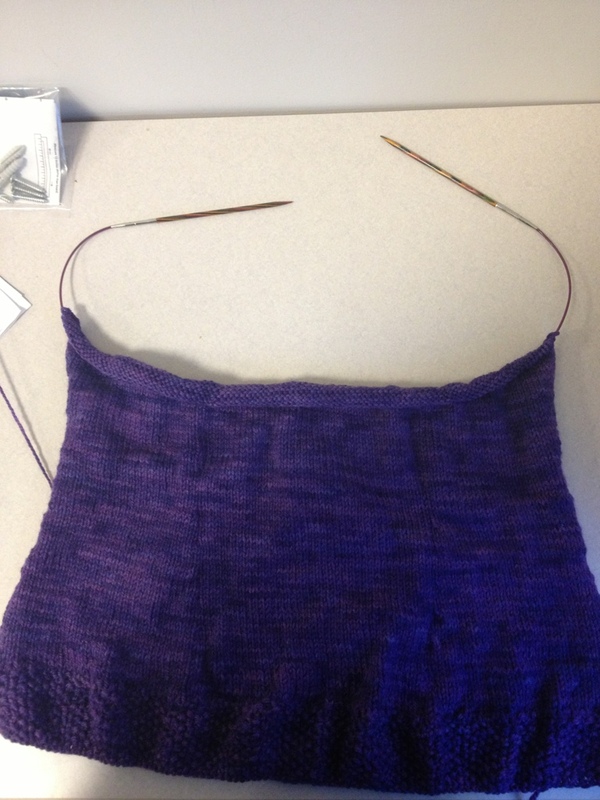 So, one unraveled Tucci Sweater later… I am starting again.